Through a chain of events of which I’ll spare you the details, I’ve found myself on the White Sunday planning committee at Mulivae. Though I’ve only experienced one White Sunday in my life, and though that day was spent at a different church, powers that be have decided I should take part in the creation and organization of this year’s event, which I guess I’m fine with, except I feel I have awfully little to contribute. Also, with the year 13 camp, I feel a little overloaded as it is. White Sunday, as I understand it, is a holiday to honor children. It’s the third supplementary component to Father’s Day and Mother’s Day. There’s usually special components of church services for children to dance and sing and perform, and children are often treated to ice cream and special treats for the day. It’s a nice enough idea, I suppose, but I still don’t wholly understand the sentiment or the custom. And I guess that’s why I feel out of place on this planning committee. 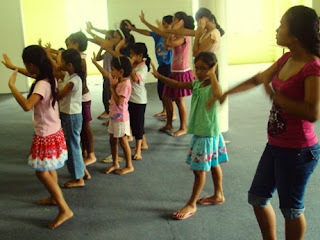 I got a bit of a nudge to write a skit for the children to perform, but I quietly bowed out of that. The Catholic mass doesn’t lend itself well to skits, and beyond that, I assume this skit would have had to have a moral or a message or some sort of overarching meaning, and I don’t feel comfortable enough to come up with that sort of thing. So mostly I sit in the back of the room and try my best to stay low profile. 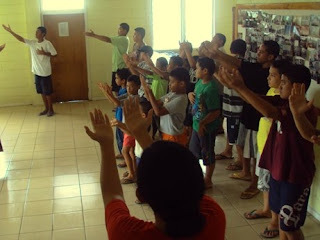 The skit idea has been abandoned, but there are plans for the children to lead the congregation in the entrance song and for them to do a choreographed dance later in the mass. Today I was asked to sit next to the stereo and hit the play button when cued. Perfect. I was ready and willing for this job. But as it turns out, the woman who is leading up the dance portion is going on a pilgrimage to Rome next week, and someone needs to be able to help the boys rehearse their part of the dance routine. All eyes pointed to me. So I begrudgingly agreed. 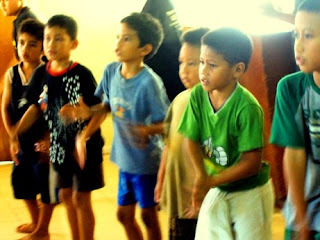 Singing and dancing is big in Samoa, and the boys throw themselves into it. There’s one step in which they go down on one knee, and they all do it so dramatically. It’s almost as though they lunge. Also, watching very small children dance is inherently hilarious. And it works whether they’re instep or not. In any case, I half-assed the dance and the lunging and maintained my low-pro as best I could. A bunch of girls from the youth group showed up to help lead rehearsal, and I figure I can count on them to lead the boys next week. I’ll show up and do what I can, but I figure my rhythm is poor enough it would be irresponsible to leave myself in any position of authority. I figure I’m best left to press play on the stereo. I got that move down. Younger girls watching the older ones. 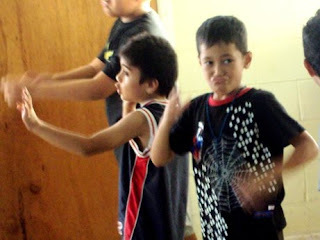 I totally caught this kid doing Robot Arms. Awesome. ooh! can you get video of the dancing? PS I love the robot arms kid. Don't blame you for feeling like a fish out of water in this role...unless you have done early childhood education, or have been a camp counselor, or have been a parent, planning skits and dances etc would not come naturally. After you have had 2 or 3 kids, you'll be a natural! Oh, Barb, he's being modest. He's done a lot of skits. And as far as dancing, I think we have a video of "Baby, Take a Bow" hidden away. hmmm i'm starting to get worried now...Matt hasn't done his daily blog yet...hope everything is ok.
Miss reading your blog this morning, hope all is good. Manuia le weekend. After all those swimming lessons, this should come easy! You're a natural already! I was home that White Sunday...and attended Mass..you guys did a good job!..I was surprised at how the Sunday School number had grown!...sorry you were thrown under some pressure there...but our community (9:15) enjoy having young people participate in these kinds of events because we bring in new ideas or something...I also should mention that on that Sunday I sat with my niece behind a "palagi" wearing white like the rest of Sunday School..I flipped when my Mom told me after Mass that it was you... LOL...I was like.."THAT WAS MATT?!" lol..u're quite the celebrity!...btw...the robot arms boy is Stanley cute kid! lol..my next visit home..he'll prolly be taller than me!..